An Irish priest who played a key role in brokering peace in Northern Ireland has died. 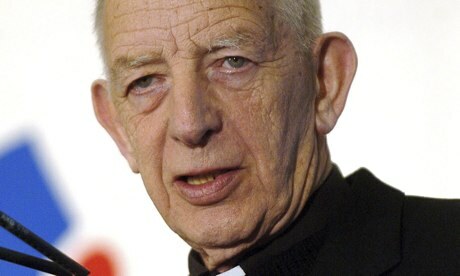 Fr Alec Reid, 82, acted as a clandestine go-between ferrying messages to and from republicans and the British and Irish governments in the earliest stages of the peace process in the 1980s. Years later, with paramilitary ceasefires delivered and the 1998 Good Friday peace accord signed, he acted as an independent witness to the decommissioning of the IRA's arsenal of weapons. During the Troubles his image was seared into the public conscious when he was pictured kneeling over the bloodied corpse of one of two British soldiers he performed the last rites on after they were beaten and murdered by a republican mob in west Belfast. The Redemptorist order of Catholic priests, of which the Co Tipperary born cleric was a member, announced that he died peacefully in hospital in Dublin. The Irish president, Michael Higgins, led tributes to the late cleric, who in his later years made Dublin home. "Fr Reid will perhaps best be remembered for the courageous part he played in identifying and nurturing the early seeds of an inclusive peace process," he said. "Fr Reid's role as a channel for peace laid the ground for the achievement of the IRA ceasefire and created the political space for the multiparty talks that ultimately led to the Good Friday agreement. While he spent the last few years of his life in Dublin, Fr Reid would have been gratified by the positive transformation that is under way throughout Northern Ireland, and especially in the Belfast that he loved so well." The cleric had a long association with Clonard church in west Belfast and his funeral will be held there on Wednesday. "He will be especially remembered for his work in the Northern Ireland peace process," the Redemptorist order said. Reid was a key confidante of Sinn Féin's president, Gerry Adams, and the republican leader trusted him to ferry messages to and from the then Social Democratic and Labour party leader, John Hume, and contacts in the British and Irish governments. Adams on Friday described the cleric's former base in Clonard as "the cradle of the peace process". He said he was tenacious in his efforts to end the conflict. "There would not be a peace process at this time without his diligent doggedness and his refusal to give up," said the Sinn Féin leader. Adams, who recently visited Reid at his hospital bed, said he and the cleric had many discussions during the Troubles about how the violence might be ended. "Out of those conversations emerged a commitment to dialogue as the first necessary step along that process and a commencement of a process in the early 1980s to commence a process of dialogue with the Catholic hierarchy, SDLP leader John Hume and the Irish and British governments," he added. Seven years after the signing of the Good Friday agreement, Reid was again called upon to help the peace process move on. The presence of the cleric and Methodist minister the Rev Harold Good, as the IRA put their weapons beyond use, was vital in convincing those sceptical of republicans' intentions. The priest once famously recalled that an armed IRA member present for the decommissioning act handed over his assault rifle, which Reid said became the last weapon to be "put beyond use". "The man handed it over and got quite emotional," said Reid. "He was aware that this was the last gun." Seventeen years earlier, the cleric witnessed the brutality of IRA violence when he tried desperately to save the lives of the two soldiers who had inadvertently driven into the funeral procession of an IRA member. He was unable to stop corporals David Howes and Derek Wood being beaten and shot, having been threatened with death if he did not get out of the way. The killings was one of the most shocking incidents of the entire Troubles. While the dramatic picture of the cleric knelt beside Howes was beamed around the world, no one would know until years later that beneath his coat that day Reid was carrying an envelope containing one of the numerous top secret messages he ferried between Sinn Féin and Hume. The churchman's career was not without controversy. In 2005 he prompted outrage in some quarters when he likened the unionist treatment of Catholics in Northern Ireland in the past to the Nazis' treatment of the Jews. The soldiers were pulled from the car as they where blocked from getting out of the area by black taxis. They where pulled out though the windows by republicans, beaten and stripped naked on waste ground before being executed. He was also stabbed four times in the back of the neck and had multiple injuries to other parts of his body. Redemptorist priest Father Alec Reid, who was later to play a significant part in the peace process leading to the 1998 Good Friday Agreement, arrived on the scene. One of the most enduring pictures of the troubles shows him kneeling beside the almost naked bodies of the soldiers, his face distraught as he administered the last rites. The events of March 19, 1988, lasted only 15 minutes but, because of the nature of the deaths and because much of the sequence was televised within hours, they are regarded among the most shocking in Northern Ireland's recent history. The bodies of the dead soldiers were flown to RAF Northolt by Hercules transport plane. Their families watched as the coffins, draped in Union flags, were carried from the aeroplane by colleagues with the band of the Corps of Signals playing in the background. Prime Minister Margaret Thatcher was at the airfield.